Lot on my mind these days, and seemingly less time for Notes. That, combined with delicious summer beers to beat back the nearly oppressive heat, and I find myself playing catchup tonight. Our focus is the 2013 Toasted Head Cabernet Sauvignon, first Cab that I’ve had from this winery; I’m fairly sure I’d just tasted their whites previously. 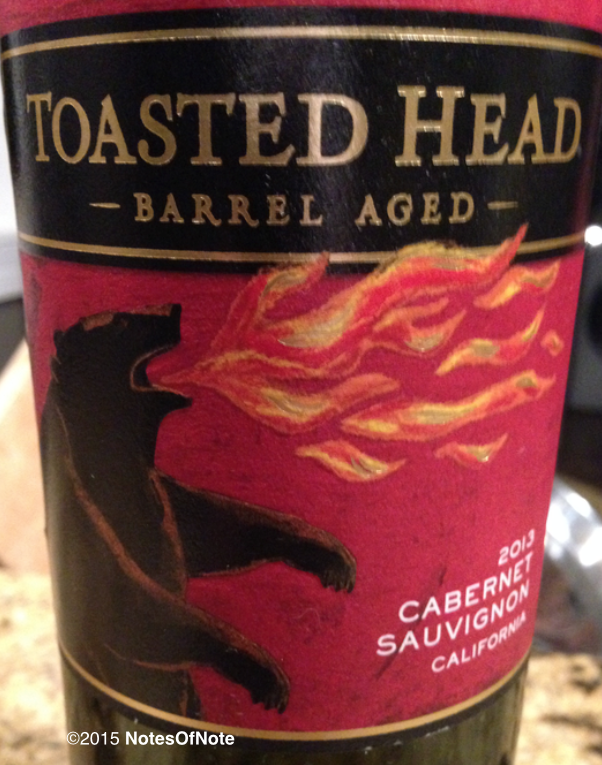 2013 Toasted Head Cabernet Sauvignon, Yolo County, California, USA. The Toasted Head had interesting taste pockets. It was a Cabernet equivalent of the summer pond–you know the one I mean? It’s cool, its refreshing, and then you hit this warm spot and the water changes all around you. This 2013 is similar in that you are sipping some fine red wine, and then you hit this berry patch and your taste buds go crazy for all the cherry and dark berry flavors. We started on the Toasted Head yesterday and tonight are finishing it off with some great leftover steaks (not too proud to say Frank’s Red Hot was liberally applied to it) and white rice seasoned with fresh scallions. Good stuff, just like the vino. This entry was posted in Cabernet Sauvignon and tagged $10-$15, California, california winemaking, Dunnigan Hills, USA, Yolo County.